Understanding complex data and processes is often not easy. Researchers use 3D visualizations on curved surfaces to feel as a part of the scene. A typical example of such an application is the 3D representation of an operation on the human body, which is enriched with additional data such as ultrasound, CT and MRI images. The Virtual Reality Studio “Da Vinci” has existed at the Zuse Institute Berlin for about ten years now. Together with Virtalis GmbH, Fraunhofer FOKUS has now renewed the projection technology in the “Da Vinci” studio. 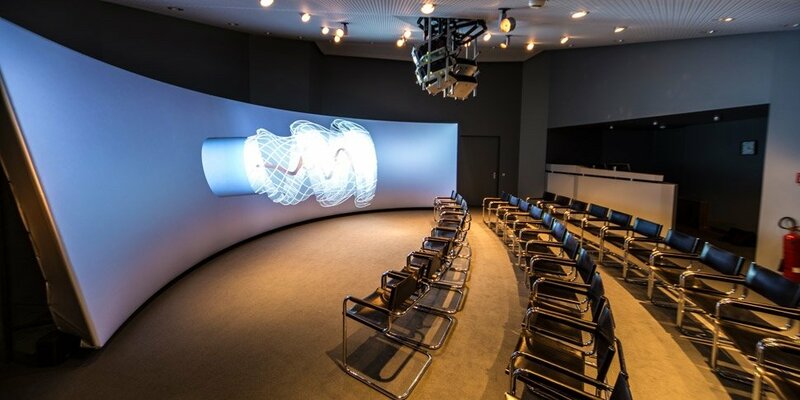 Each of the three projection channels was equipped with two new Canon Xeed WUX4000 projectors and Barco warping units that warp and dazzle the stereoscopic images in real time. In addition to the new projectors, the Zuse Institute Berlin will in future use the projector autoalignment technology of the VISCOM division of Fraunhofer FOKUS. For automatic projector calibration, digital cameras are used to capture test images projected onto the screen by the projectors to be calibrated. Intelligent image processing algorithms then ensure that the partial images of the projectors are rectified and adapted to the projection screen in such a way that a high-resolution, seamless overall image is created. At the points where the partial images of the projectors overlap, they are automatically adapted exactly to each other. If the position and thus also the image of a projector changes, the calibration process is restarted and the image is automatically fitted back into the overall projection. The screen in the studio “Da Vinci” has a cylindrical shape with a height of 5.7 meters. Its radius is 4.06 to 4.6 meters. The opening angle is 126°. Autocalibration by Fraunhofer FOKUS was originally developed in close cooperation with Carl Zeiss and is now used worldwide in planetariums, 360° cinemas, amusement parks and simulators. Most recently, a driving simulator at RWTH Aachen University was equipped with it.